To have full functionality of the BeyondTrust software and to avoid security risks, it is very important that as soon as possible, you obtain a valid SSL certificate signed by a certificate authority (CA). While a CA-signed certificate is the best way to secure your site, you may need a self-signed certificate or an internally-signed certificate (see Create a Self-Signed Certificate). To obtain a certificate signed by a certificate authority, you must first create a certificate signing request (CSR) from the /appliance interface of your Secure Remote Access Appliance. You will then submit the request data to a certificate authority. Once the signed certificate is obtained, the BeyondTrust software should be updated. In addition to the CA certificate request feature, BeyondTrust includes functionality for obtaining and automatically renewing its own TLS certificates from the open Certificate Authority Let's Encrypt, free of charge. The DNS for the hostname you are requesting must resolve to the appliance. The appliance must be able to reach Let's Encrypt on TCP 443. Let's Encrypt must be able to reach the appliance on TCP 80. For more information, please see letsencrypt.org. Enter the fully qualified domain name (FQDN) of the appliance in the Hostname field. Use the dropdown to choose the certificate key type. As long as the above requirements are met, this results in a certificate that will automatically renew every 90 days once the validity check with Let's Encrypt has completed. The appliance starts the certificate renewal process 30 days before the certificate is due to expire and requires the same process as the original request process does. If it has been unsuccessful 25 days prior to expiry, the appliance sends daily admin email alerts (if email notifications are enabled). The status will show the certificate in an error state. When using a CA issuer other than Let's Encrypt, the first step is to create the CSR. The request data associated with the CSR contains the details about your organization and BeyondTrust site. This request data is submitted to your certificate authority for them to publicly certify your organization and Secure Remote Access Appliance. Certificates consist of a friendly name, key, subject name, and one or more subject alternative names. You must enter this information in the BeyondTrust /appliance web interface to create a certificate signing request. Log into the /appliance web interface of your Secure Remote Access Appliance and go to Security > Certificates. You will see a "Secure Remote Access Appliance" certificate listed. This is a standard certificate which ships with all Secure Remote Access Appliances. Both the certificate and its warning should be ignored. In the Security :: Other Certificates section, click Create. Create a descriptive title for Certificate Friendly Name. Examples could include your primary DNS name or the current month and year. This name helps you identify your certificate request on your Secure Remote Access Appliance Security > Certificates page. Choose a key size from the Key dropdown. Verify with your certificate authority which key strengths they support. Larger key sizes normally require more processing overhead and may not be supported by older systems. However, smaller key sizes are likely to become obsolete or insecure sooner than larger ones. The Subject Name consists of the contact information for the organization and department creating the certificate along with the name of the certificate. Enter your organization's two-character Country code. If you are unsure of your country code, please visit www.iso.org/iso-3166-country-codes.html. Enter your State/Province name if applicable. Enter the full state name, as some certificate authorities will not accept a state abbreviation. In Organization, provide the name of your company. Organizational Unit is normally the group or department within the organization managing the certificate and/or the BeyondTrust deployment for the organization. For Name (Common Name), enter a title for your certificate. In many cases, this should be simply a human-readable label. It is not recommended that you use your DNS name as the common name. However, some certificate authorities may require that you do use your fully qualified DNS name for backward compatibility. Contact your certificate authority for details. This name must be unique to differentiate the certificate from others on the network. Be aware that this network could include the public internet. In Subject Alternative Names, list the fully qualified domain name for each DNS A-record which resolves to your Secure Remote Access Appliance (e.g., support.example.com). After entering each subject alternative name (SAN), click the Add button. If you entered the fully qualified domain name as your subject's common name, you must re-enter this as the first SAN entry. If you wish to use IP addresses instead of DNS names, contact BeyondTrust Technical Support first. A SAN lets you protect multiple hostnames with a single SSL certificate. A DNS address could be a fully qualified domain name, such as support.example.com, or it could be a wildcard domain name, such as *.example.com. A wildcard domain name covers multiple subdomains, such as support.example.com, remote.example.com, and so forth. If you are going to use multiple hostnames for your site that are not covered by a wildcard certificate, be sure to define those as additional SANs. If you plan to use multiple Secure Remote Access Appliances in an Atlas setup, it is recommended that you use a wildcard certificate that covers both your BeyondTrust site hostname and each traffic node hostname. If you do not use a wildcard certificate, adding traffic nodes that use different certificates will require a rebuild of the BeyondTrust software. The certificate request should now appear in the Certificate Requests section. Once the certificate signing request has been created, you must submit it to a certificate authority for certification. You can obtain an SSL certificate from a commercial or public certificate authority or from an internal CA server if your organization uses one. BeyondTrust does not require or recommend any specific certificate authority, but these are some of the most well known. Comodo (www.comodo.com) - As of 24 February 2015, Comodo is the largest issuer of SSL certificates. Digicert (www.digicert.com) - Digicert is a US-based certificate authority that has been in business for over a decade. GeoTrust, Inc. (www.geotrust.com) - GeoTrust is the world's second largest digital certificate provider. GoDaddy SSL (https://www.godaddy.com/web-security/ssl-certificate) - GoDaddy is the world's largest domain name registrar, and their SSL certificates are widely used. Symantec SSL (www.websecurity.symantec.com/ssl-certificate) - 97 of the world's 100 largest financial institutions and 75 percent of the 500 biggest e-commerce sites in North America use SSL certificates from Symantec. Once you have selected a certificate authority, you must purchase a certificate from them. BeyondTrust does not require any special type of certificate. BeyondTrust accepts wildcard certificates, subject alternative name (SAN) certificates, unified communications (UC) certificates, extended validation (EV) certificates, and so forth, as well as standard certificates. 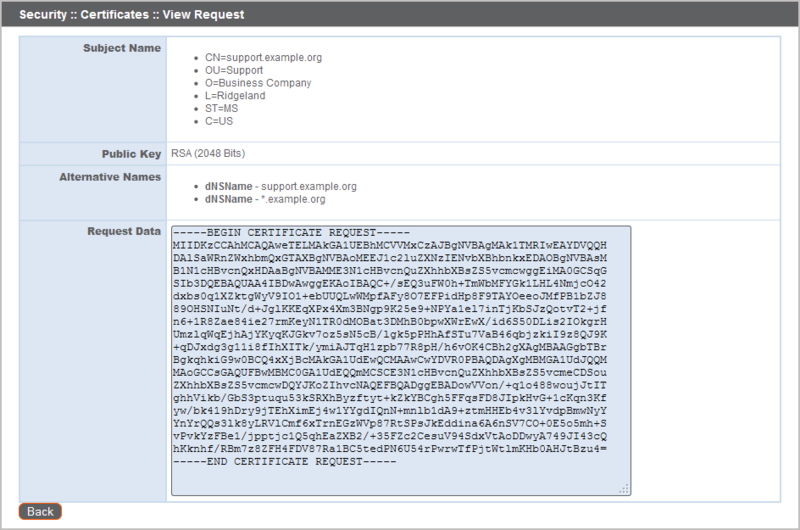 When prompted to submit the request information, log into the /appliance interface of your Secure Remote Access Appliance. Go to Security > Certificates. In the Certificate Requests section, click the subject of your certificate request. Select and copy the Request Data, and then submit this information to your certificate authority. Some certificate authorities require you to specify the type of server the certificate is for. If this is a required field, submit that the server is Apache-compatible. If given more than one Apache type as options, select Apache/ModSSL. You must download all of the certificate files in your certificate chain to a secure location. This location should be accessible from the same computer used to access the /appliance interface. Sometimes the CA's certificate download interface prompts for a server type. If prompted to select a server type, select Apache. If given more than one Apache type as options, select Apache/ModSSL. To identify which root is appropriate for your certificate chain, you should contact your certificate authority. However, it is also possible on most systems to open your certificate file on the local system and check the certificate chain from there. For instance, in Windows 7, the certificate chain is shown under the Certification Path tab of the certificate file, and the root certificate is listed at the top. Opening the root certificate here normally allows you to identify the approprate root on the CA's online repository. Once you have downloaded all the certificate files for your certificate chain, you must import these files to your Secure Remote Access Appliance. Log into the /appliance interface of your Secure Remote Access Appliance. Go to Security > Certificates. In the Security :: Other Certificates section, click the Import button. Browse to your certificate file and click Upload. Then upload the intermediate certificate files and root certificate file used by the CA. The BeyondTrust server certificate has an Issued To field and/or an Alternative Name(s) field matching the Secure Remote Access Appliance's URL (e.g., support.example.com). Intermediate certificates have different Issued To and Issued By fields, neither of which is a URL. The root certificate has identical values for the Issued To and Issued By fields, neither of which is a URL. If any of these are missing, contact your certificate authority and/or follow the instructions given above in this guide to locate, download, and import the missing certificates. At this point, the appliance should be fully operational and ready for production. To learn more about how to manage and use BeyondTrust, please refer to www.beyondtrust.com/docs.